It is June 2008 and time for my favorite European show, Sainte-Marie-aux-Mines. This year we are a group of five men—myself, my two sons Will and Carl, friend Ben Sobczak, and my friend and fellow gem dealer Mark Kaufman. We arrive without too much travel trouble into Frankfurt airport and navigate our way to Ribeauvillé, just in time for lunch. It is tough in the Alsace region with so many fine restaurants, great French (real) wines and so little time, but we make the most of it. After lunch we are stuffed with foie gras so we drive to what has become our home at the Sainte-Marie show, in the fire tree forest, for the past many years—thanks to the generosity of our French friends Eric Asselborn and Alain Martaud. Quickly we unload, tossing our baggage into our condo and head to the show. We arrive on Tuesday afternoon at 3:00 and talk our way through the security with my VIP pass provided by the wonderful show manager Michel Schwab. 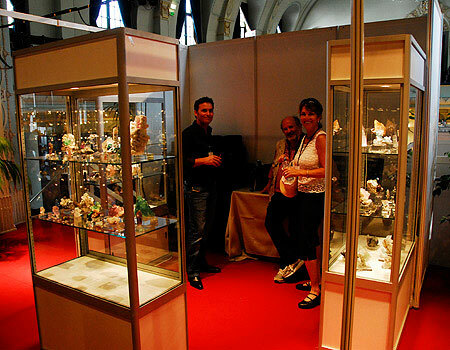 Michel has really outdone himself in expanding the show over the years; it is now divided into two venues: minerals, fossils, and meteorites in the original area, and gems, jewelry and beads in the second area nearby, with a small train going between the two at regular intervals. Despite the expansion, Michel has maintained the same charm of the Sainte-Marie show. He greets us all warmly and I know this will again be a great mineral experience for all of us. I see a lot of the same suspects arriving this afternoon from America. One would think that the high euro would keep some of us away, but the European dealers are smart and make many deals in dollars, so here we all are. Scott Werschky, Danny Trinchillo, Marshall and Charlotte Sussman…. I have emailed prior to the trip, and asked around this afternoon, but there is no “buzz” concerning new finds. Just lots of material to be seen. The show has upgraded a lot over the years and this afternoon the theatre (now called “Espace Prestige”) is almost set up—a day earlier than usual—and what a nice selection of booths, many with superb, well-lit cases, just like the Westward Look show, or TGMS, Tucson shows. Less than a decade ago many dealers just set their minerals out on tables on a blanket in this same theatre! The theatre seems to have the same cast of dealers as last year. As we enter into the theater Jordi Fabre’s booth is set up on my left. 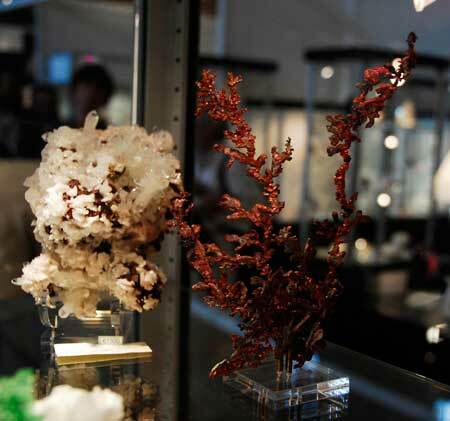 Jordi is almost finished situating their minerals and immediately I find a fine Chinese gem, a single crystal of calcite, which he says may be featured in le Règne Minéral, the French mineral magazine, an excellent publication to which any mineral collector should subscribe. I like it, so we purchase it. We walk into the main area and I greet or am greeted by all our friends here, and it is a party-like occasion. Just before the stage is Alain Martaud who is our main contact here; he shares Pala’s booth in both the Denver and Tucson shows. His booth is large and fine. He features a whole case of excellent French minerals and several have been reserved already, including a fine Chessy malachite pseudomorph after cuprite, almost 2 centimeters! I am sad to have missed it. But he assures me that I will find another. One of this year’s featured exhibits is the mines of Chessy, a remarkable mineralogical locality in the Rhône region of France. 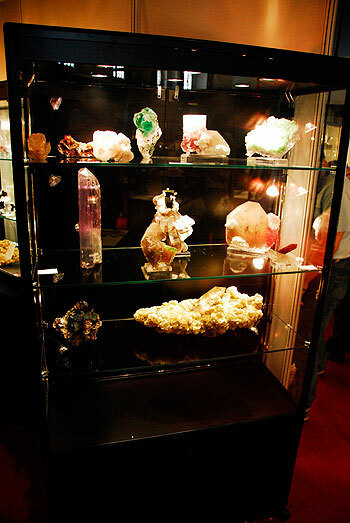 I have been asked to bring some of my own Chessy azurites and cuprites, so we find the two relevant display cases and ask Alain to include my 14 pieces. I am happy to see already displayed the two best specimens from the École des Mines Museum in Paris, certainly among the finest ever recovered. But there are many fine Chessy pieces and the exhibit is superb. Up on the stage are first the Gobin brothers, long-time friends, and they always have fine pieces. Brice Gobin shows me a great green fluorite from the Erongo Mountains in Namibia, perhaps 10 cm on edge, on a large quartz that has color-center phantoms—truly superb and new to my eyes. He had another, finer one, he says, at the Dallas show last May, so perhaps we shall see a few more. Brice also shows me a fine blue Erongo single jeremejevite crystal, 3 cm. long and perhaps 5 mm. wide, much larger than normal, but he tells us there were some giants, some perhaps as much as 7 cm. by 1 cm.—unheard of in my experience. 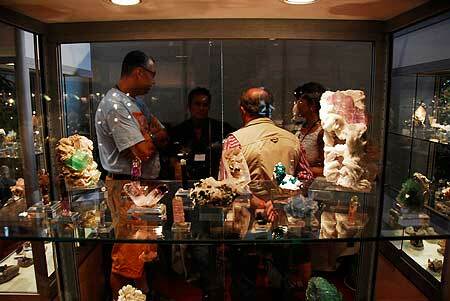 I look forward to sharing display space with the Gobins at October’s trade-only ICA International Gem Show. Behind him, I see the showcases of Marcus Budil. These are the same metal cases, made in USA, that are featured in many of the rooms of the Westward Look show. He is the first to import them into Europe. Fine minerals show a remarkable difference with proper lighting. I expect many other dealers here will follow up with similar designs or even improvements. Next door is Mr. Prato with some very fine Namibian amethysts. These seem larger and more intensely purple than usual, so I select and purchase a fine one. We leave the theatre area and head out for the buildings and tents where many foreign dealers set up. Dozens of Chinese, Moroccans, Africans, Brazilians, and even a Bolivian are setting up. We are in search of anything that takes our fancy; however, Wendell Wilson has asked that I find whatever might be new to write up for the Mineralogical Record. Mark Kaufman is happy searching for broken pieces of gemmy crystals to cut for rare gem collectors, but his pickings this first day are limited. We leave the show for home in the late afternoon and stop at the Super U market for sundries, wine, and cheeses. Next morning, we are early to the setting up. There are more dealers with displays today, so I start to search what is new, and of course visit with everyone I know. We are shown, clandestinely, some dark blue barites from Daye, Hubei Province, China with Jürgen Tron. My spy is none other than Jeff Scovil, without whom I would not be able to do these reports. Jeff shows me also some small, pale-orange helvites-on-quartz miniatures found for the first time from Madan, Bulgaria by the Spirifer group. These same dealers have lovely pyrite clusters from the closed 9th September mine, Madan, Bulgaria. These are groups of pyritohedrons, mirror bright, in miniature sizes—really superb. We have all split up looking over the show and have met back at the theatre for another look through. Ian Bruce and Wayne Leicht have diplayed some matrix spessartines from the new find in Tanzania. I had spotted a few other dealers with the same type of material, but these seemed the best selection. Several were gemmy-orange, 2 cm., on a schist matrix, quite showy, and priced around €1,000. Ian also shows me a small group of azurite crystals from Morocco, very attractive, with a coating of an unknown greenish mineral. Said to be from a new locality; these bear watching for. Just before noon, I run into Gabriel Risse with my son Carl. He told us the day before that his mineral collection is for sale, since he is looking to upgrade his living area and has a 9-month-old son. He will not give up collecting and will start again. He reminds me that I first met him 20 years ago at the Munich show with Marcus Budil, and that we have dealt often and successfully since then. Amazing how time flies. He takes us to his hotel room and there we see the collection. He is proud of his 140 or so excellent pieces, and has priced them fairly. 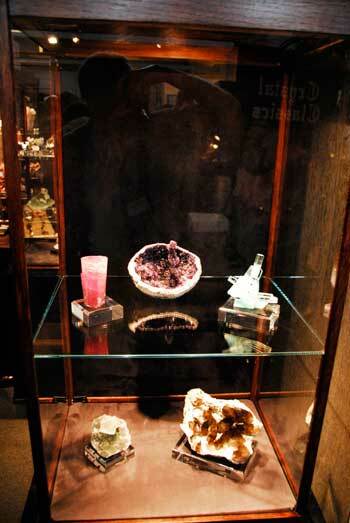 He has only kept a few self-collected specimens and one Pakistani tourmaline from his early trips there. We haggle a little and make a deal for the whole lot. This will make this year’s Sainte-Marie show a great success. After lunch, it’s time to see the local sights, especially for Ben Sobczak as it is his first time here; we shall all enjoy it. 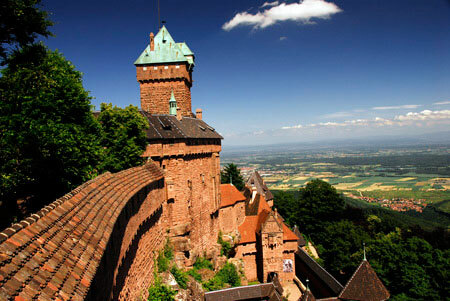 First stop is Haut-Kœnigsbourg Castle, a great fortress overlooking the Alsace valley. The castle is near La Montagne des Singes (Monkey Mountain) a preserve for endangered monkeys (300 Barbary Macaques), and they are crazy today as it is less hot than normal. We feel refreshed and ready for more action tomorrow. We again get to the show early this Thursday and the set-up is more or less complete. We split up again and search different areas. I come across first-time visitors the Megaw family: Allison, Peter and daughter Lauren. They are flush with excitement and have already found a few very exciting things. I hope that the Mineralogical Record articles on Sainte-Marie have in some way influenced them to come. I visit Mikon, and Mr. Mathias Rheinländer finally has set up enough to let me in and select a few new items. Laurent Gautron has a section in Mikon with his latest shipment from Mali in Africa. He has garnets, and prehnites as usual, but this time he has a few fine green idocrases, up to 4-cm crystals in groups, which to me are new. From Mikon it is time to visit Czech dealer KARP for an espresso, and Vaclav Budina offers me a taste of fine Czech beer they serve on tap. This booth is perhaps the most popular among those in the know in the show. I find a few new items from Dalnegorsk, Russia, including a few fine ilvaites. He also has rare faceted, colorless forsterites from Pamir (Tajikistan), which I find interesting and select two for stock. In a Chinese booth nearby I find a few pale lavender stalactitic fluorites with pyrite balls on them. I have seen similar in Tucson this year with Marcus Origlieri but only two. The locality is given as Xiefang (Mine), Jiangxi Province, China. We run into Gabriel and he has just purchased his first new specimen. A beautiful cavansite with calcite from India, for the new collection. Maybe in another 20 years Will and Carl can purchase this one. The crowds are much larger and parking is far away today. I go down into the basement of the theatre and visit photographers Louis-Dominique Bayle and Jeff Scovil to see if anything else new has appeared. They show me some native copper as dendritic groups, and spinel twinned clusters etched from calcite from La Calamita, Elba, Italy. New and different and in the possession of Scott Werschky, of Miner’s Lunchbox. He says he got them from Wendel Mineralien. He also says he has heard that the Elba pegmatites may indeed be in for a new mining adventure starting in 2009, confirming a rampant rumor that may be just rumor but makes the mineral industry interesting. Mark Kaufman calls me from the gem show area and says I should come over to see an old collection of rough and cut haüynes, so I board the small train bound for the gem show area, where Mark shows me around. 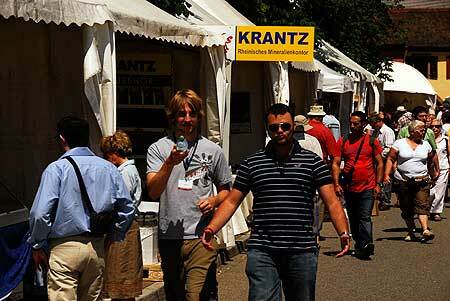 Mark is perhaps the fastest searcher in gem show history. He misses little and does it in record time. The haüynes are indeed interesting with a few over 1 carat, one over 2 carats and fine blue. There are also a few bags of fine, if small, rough. The collection is great but priced in euros so it shall have to go elsewhere other than the U.S. market, in my opinion. Other things of interest are several dealers offering Sri Lankan sapphire crystals, but when they see me they apologize up front that prices have risen to high levels in Sri Lanka. Indeed, they are much more appreciated locally now, and prices are too high for me to bring any home. I return with Mark to the mineral show portion, to meet the gang for another great dinner, and see another fine new mineral locality piece. 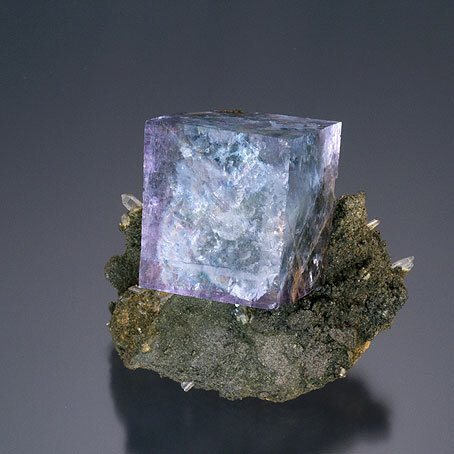 This is a montroseite said to be the finest ever found from Prachovice, Železné Hory, Czech Republic. The piece is about 6 centimeters across, a complete carpet of shiny black needles on matrix. And again in the possession of Scott Werschky; he indeed has turned up some rare items. Our day has come to an end and the final thing we see on the way out is Gilles Emringer’s Ferrari parked just outside the show. I am immediately taken by nostalgia, since one of my favorite sights was often seeing Gilles’s Ferrari parked on the side of the main street in Sainte-Marie with his boot up and selling minerals from the trunk! 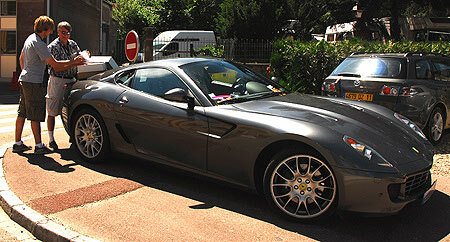 This is a beautiful 599 GTB Fiorano silvertone-colored (Formula One) Ferrari, so I show Ben how it must have felt to buy flats of minerals from Gilles in the older days. Gilles’s company, Multiaxes (or as I call it Multitaxes to a delighted chuckle from Gilles himself) now has a real booth just across from the theatre. Tonight is our last dinner in the Sainte-Marie; we celebrate with friends and leave in the morning for Dijon to see where our “Flashes of Colour” exhibit was shown and are all excited for next year’s Sainte-Marie-aux-Mines! 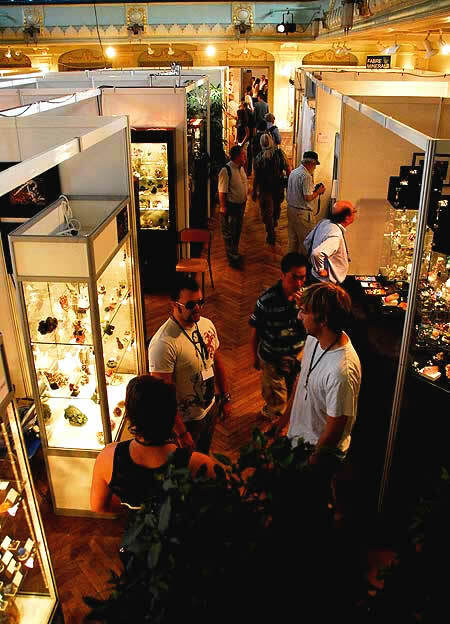 Sainte-Marie 2009 is June 25–26 for dealers and June 27–28 for the public. To learn more, visit the show website.